Immunity is a biological term that describes a state of having sufficient biological defenses to avoid infection and disease. 1. Eat a fresh whole food diet which includes a lot of fruits and vegetables in a day. These contain antioxidants, vitamins and minerals which protect the body against disease. Choose organic produce to avoid the antibiotic and pesticide residue in food. 2. Avoid alcohol, cigarettes and sugary, fried and fatty foods - They have been shown to depress immune system activity and reduce levels of vital vitamins and minerals. Instead of coffee, drink green tea. It's rich in the antioxidants and catechins which can prevent bacterial and viral infection. 3. Eat a wide variety of foods such as almonds, lemon, grapes etc. to get all the nutrients you need; eating little and often for the maximum absorption. 4. Add herbs and spices to foods to build immunity. For example, garlic is a natural antibiotic, cinnamon helps dispel colds and flu, ginger prevents stomach upsets, basil in antibacterial and anti parasitic, and oregano is antibacterial and antifungal. 5. Exercise for at least 30 minutes, 4 to 5 times a week. Moderate exercise has been shown to increase the levels of the body's natural defender cells. Avoid excessive exercise which reduces immune activity. 6. Stress depletes levels of protective vitamins and makes you more susceptible to an infection. Relaxation techniques, regular massage or a relaxing hobby can seriously reduce stress levels. 7. Make sure that you sleep well. Having too little sleep inhibits the body's restorative and repair mechanism and reduces your immunity to infection. 8. Lose weight. Being severely overweight reduces your production of antibodies and white blood cells, which fight off bacterial infection. 9. Self medication is always bad; consult your doctor for any kind of queries. 10. Remember that even healthy people fall ill occasionally. 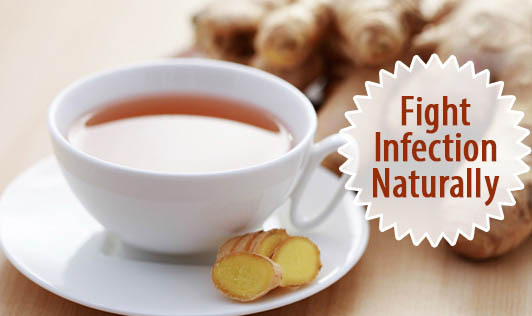 At the first sign of viral or bacterial infection, follow some of the natural remedies.